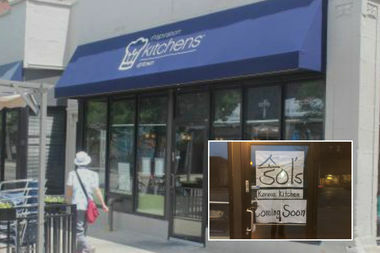 At 5 p.m. Friday, Sol's on Sheridan will open in the former home of Inspiration Kitchens. The eatery will open this summer. Approving the Tex-Mex chain is "slapping the local Hispanic flavor in the face," one neighbor said. "We had a lot of interest in that property; they had the best chance of long term success," broker said. The store's grand reopening is set for April 13, including a free-produce-for-a-year sweepstakes. The company announced the Lincoln Avenue cafe is permanently closed as of Monday. This week a "Restaurant For Sale" sign was affixed to the front door of Q-Tine, 2339 N. Milwaukee Ave. The Lawrence Avenue store is one of hundreds of Radio Shacks closing across the country. The Gladstone Park store is one of hundreds targeted in a nationwide purge this month. The store is expected to open in the fall. The bar will open at 4 p.m. Thursday. A "pre-sale" with a goal to eventually liquidate all baubles starts Friday at 2139 N. Damen. The eatery, 2906 W. Armitage Ave., serves classic Indian dishes like chicken tikka masala and samosas. All day Wednesday, 20 percent of sales will go to Wicker Park's A.N. Pritzker School. Baker and Nosh is closing its 1313 W. Wilson Ave. shop as it moves a few doors down.